Sophsterlicious • UK Blog: Italian Deliciousness at Salvo's, Leeds. This is a different post for me to write, but when I recently reviewed the Peroni Vivi in Stile app for my iPod Touch, the PR kindly offered me the oppurtunity to try out one of the top ten suggested places to visit in Leeds. ... 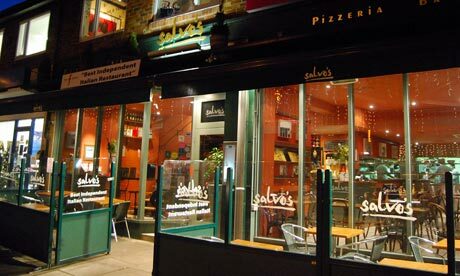 So I chose to go to dinner with my boyfriend as we've had a rough year and we don't get out that much right now..
My choice of resteraunt was Salvo's in Leeds. If you ever watched Gordon Ramsay's The F Word show, they were on it, and were awarded the best UK neighbourhood Italian resteraunt on his show. They have also won countless awards and are always very busy. The atmosphere in the restaurant was lovely and the staff were really friendly and helpful. We both had the Chilli Prawn Starter (Gamberoni Abruzzese). I love prawns and my eyes lit up when I saw this.. It was great and the chilli was not overly spicy.. I'm not good with spice! For mains we both had the creamy chicken mushroom pasta dish (Tagliatelle Al Pollo), it was amazing. I love Italian food and this is the nicest pasta dish I have ever tasted. The chicken was succulent, the sauce was creamy, the pasta was perfect. For dessert had some chocolate brownie. It was perfection, It had the crunch but soft gooey inside like it should have. We both left leaving well and truly stuffed, but on a high after a lovely night out in a great resteraunt. If you live in or around Leeds I highly recommend you check Salvo's out. The service and food are spectacular and the prices are very reasonable for the top quality. We cannot wait to revisit. Do also check the app out if you have an iPhone, it's really easy to use and great for style inspiration. I remember seeing it on telly...... I would love to visit it sometime, but I have never been to Leeds. I will hint to my husband! Yum. I heart chiken andmushroom pasta, your meal sounded delishos. Thank you for your lovely comments. It is great you enjoyed your meal with us. And thank you for recommending us on your blog. We hope that you will visit us again soon.